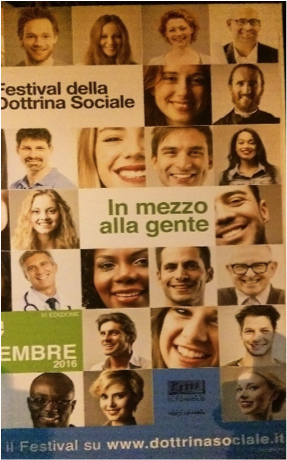 “In the midst of the people” was the organizing perspective used to bring together more than 500 participants at the Festival of Social Doctrine in Verona Italy last weekend. Small business leaders, church leaders and members of government were represented in the festival as were numerous representatives of church associations and civil society. They showcased some of the very successful projects that continue to evolve on cooperatives and credit unions and have been operating for years and presented some innovative ideas and approaches to the application of Catholic Social teaching to business and the not for ‘profit sector. 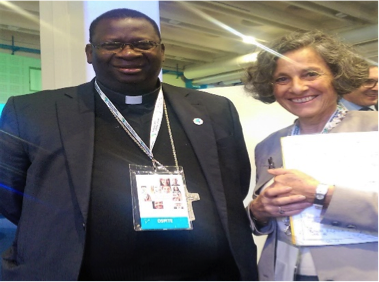 The encyclical Laudato Sí provided the motivation for the participants and the stimulation for the talks, panels and workshops. In his message to the festival Pope Francis returned to the theme of “encounter” when he encouraged those gathered to be open to the great diversity of peoples that comprise the fabric of humanity. “When you are with the people you see humanity: never exists only the head, always exists also the heart. There is more substance and less ideology. To solve the problems of the people you should start from the bottom, get dirty hands, have value, listen to the last”. In the workshop that I presented with Bishop Moses Hamugonole from the diocese of Monze in Zambia, we were asked to share some thoughts in the engagement of the churches with the mining companies and specifically in Zambia. We built our input on the call for multi stakeholder dialogue that is encouraged in Laudati Sí and the decision of the Zambian Episcopal conference in April 2016 to convene a conference on how Mining and Agriculture can contribute to sustainable development. We recalled how the extractive industry represented by the CEO’s of many major mining companies asked for a structured sustained conversation with the Vatican through the Pontifical Council for Justice and Peace. This conversation began by focusing on the poor reputation that mining has in many communities and regions and sought to explore how the industry could be a more constructive partner in promoting development. Thus was born in Rome in September 2013 the Days of Reflection and followed by Days of Courageous Conversation between major stakeholders that have now been convened four times during the intervening three years with other initiatives at national and regional events. A primary question that has been reiterated in Laudato Sí asks about the appropriate mechanisms and sustainable ways of cultivating the abundance of the natural resources in our “common home” that have been entrusted into our care and promised also to sustain future generations. This includes both the resources on the surface of the earth as well as those below the surface. How do we structure the exploration and use of these basic resources in such a way that we leave behind an inhabitable planet? Secondly we discussed the role and responsibility of each stakeholder and how they might work together to contribute to appropriate and sustainable development and be cognizant of the multiple crisis like poverty, youth unemployment, migration, destruction of the environment, deteriorating infrastructure and violence that societies face across the world? For corporations and foundations this must extend beyond philanthropy but be integrated into their very business models and operations and their investment philosophies. For governments and political leaders it requires the exercise of their authority for the promotion of the common good which includes the protection of “our common home”.